Wonder how fast can the data be transferred from your host PC to media drives or vice versa? Typically for a USB 2.0 host compliant device, it will have a maximum theoretical throughput of 480Mbps but none of the devices will be able to reach that since there are overhead and losses in real world. If you are curious to figure out how fast can your USB thumb drive or SATA (Serial ATA) hard disk drive able to sustain the transfer rate, here is a simple utility, named as HD_Speed that can display both the current and average speed in graphical view from time to time. The software utility is completely standalone and without the hassle of installation, users can run it straight away to display the throughput for any media devices in a nicely graphical view. There are few settings that users can configure such as the specific drive ,could be external USB thumb drive, media card, CD ROM, or internal SATA/PATA hard disk drives. Besides, there is a way to specify the data block size ranging from small data chunk of 1kB up to 16MB, or just set it to ‘Auto’ mode and it will cover all the data size automatically. In order to monitor specific read or write speed, users just need to select the respective category as well as burst rate and it will help to capture those data at own preference. Once completed, just click on ‘Start’ button and you are ready to go. 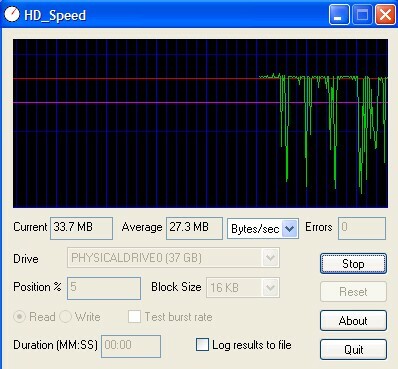 HD_Speed consumes merely at 80kB can be kept in thumb drive to be used for benchmarking between various media devices in terms of throughput performance for quick comparison.